Condoleezza Rice: "No doubt" Pakistani territory used by "probably non-state actors"
WASHINGTON (CNN) -- "There's no doubt" that the deadly attack on India's financial capital last month was planned inside Pakistan, Secretary of State Condoleezza Rice told CNN on Sunday. 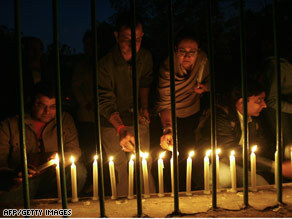 People in New Delhi, India, take part in a candlelight vigil for the victims of the Mumbai attacks on Sunday. Her comments to CNN's "Late Edition with Wolf Blitzer" were the most definitive made by a top-ranking U.S. official regarding Pakistan's connection to the November 26-29 attack on Mumbai, in which more than 170 were killed and hundreds of others were wounded. "Well, I think there's no doubt that Pakistani territory was used by probably non-state actors," Rice said. "I don't think that there is compelling evidence of involvement of Pakistani officials. But I do think that Pakistan has a responsibility to act, and it doesn't matter that they're non-state actors." Last week, Rice traveled to the region to try to ease tension between India and Pakistan, both nuclear powers and key allies of the United States. While in New Delhi, India, she called on Pakistan to take responsibility for terrorists operating within its borders. Pakistani President Asif Ali Zardari has said "stateless actors" carried out the attack while Indian authorities say they believe all the attackers were Pakistanis, specifically blaming Lashkar-e-Tayyiba (LeT), an Islamic militant group based in Pakistan. U.S. counterterrorism officials say signs point to LeT, and they haven't seen anything to rule it out. However, they have not definitively said the group is responsible. U.S. Director of National Intelligence Michael McConnell said during an appearance Tuesday at Harvard University that the Mumbai attacks were carried out by the same group responsible for the parliament attack and a series of bomb explosions aboard trains and at railway stations in Mumbai in 2006 -- though he didn't specifically name LeT. LeT has denied any responsibility for the attacks, but a suspect in custody -- whom India has said was one of 10 gunmen in the attacks -- told interrogators he was trained by LeT, Indian authorities said. India said its forces killed nine gunmen. On Sunday, Rice said LeT and al Qaeda "tend to travel in the same circles," though she declined to directly link either group to the Mumbai attack. But she stressed that Pakistan is obligated to root out terrorists within its borders. "Well, I don't want to go into too much detail here because, obviously, in counterterrorism no one wants to tip the hand of what has happened here and what may happen in the future," Rice said. "The important thing now is to get these perpetrators and to prevent follow-on attacks. And Pakistan's cooperation, Pakistan's action, is absolutely essential to doing that." Asked about possible ties between Pakistan's government and LeT, Rice acknowledged "there have been historic ties -- there's no doubt about that." "But Pakistan is a different place now with a civilian government and an army leadership that is working in concert to try to bring an end to extremism within Pakistan," she said. "We have to remember that Pakistan itself has been suffering at the hands of extremism. So whatever the history here, and there is a history, the important thing is that Pakistan act against those who used Pakistani soil to perpetrate attacks."